I recently dedicated a small section of my home office to large-scale on-the-wall graphic recording. I’ve had on hand some extra rolls on large (4-feet tall) paper, so I threw that on the wall to be able to practice standing up and capturing ideas in a larger format than I typically use. It had been a while since I had done large-scale work, so I eased back into it. While listening to this interview I focused on typography – the shaded title font is one that I don’t often use, but works well for large-scale work if you’ve got the time for it. As I was drawing and shading that title font I listened for interesting parts of the conversation that caught my attention. It was great to hear stories of Mike’s background that I hadn’t heard before, and also some of the insights gained from more recent experiences. 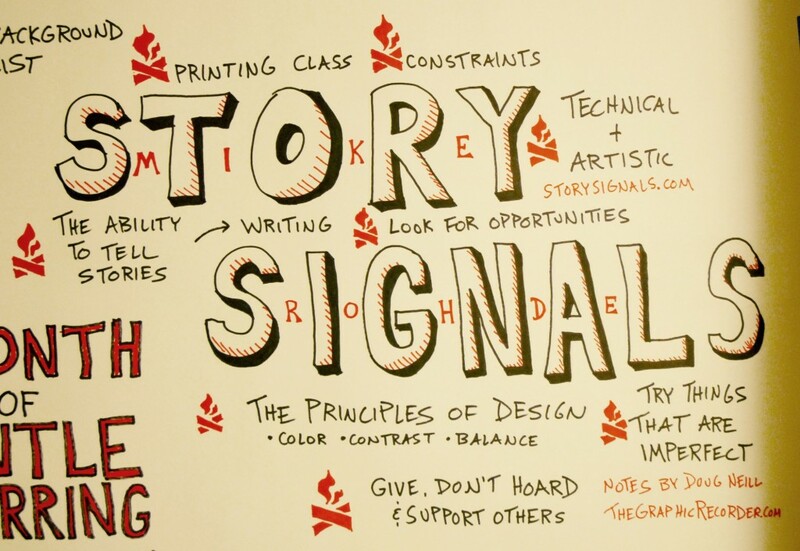 After jotting down a couple of those few-word ideas, I decided to add an icon for each, and chose the icon of the Story Signals podcast for that – not too complex of a visual addition, but enough to clearly separate each idea. I’m also on a potentially-silly kick of learning to draw with my off hand. I’ve got this idea of how fun and useful it would be to have a black marker in my right hand, color in my left, and be able to go at the page with either. I don’t know if I’d ever use both simultaneously – right now it’s more a matter of my arm getting tired, so it’s nice to switch off every now and again. To build strength and coordination with my left hand I did all of the shading and filling in of the icons with that off hand of mine. Who knows if I’ll stick with that long enough for it to become practical, but for now it’s fun just to stretch the brain a bit and develop a new skill. What have you been doing lately to practice your visual note taking skills? Share your experience in the comments below.